So, we trekked all the way to Park Slope for Italian food. We wanted to go to Frankie’s 457, but there was an hour wait. Lacking the dedication of New Yorker foodies, we set out for other cuisine in the neighborhood. We weren’t sure what we wanted–Thai, Chinese, something else entirely? Finally, we settled on other Italian food from Campo de Fiori. I was intrigued by their pizza offerings, as the reviews posted in the window discussed their perfect dough. 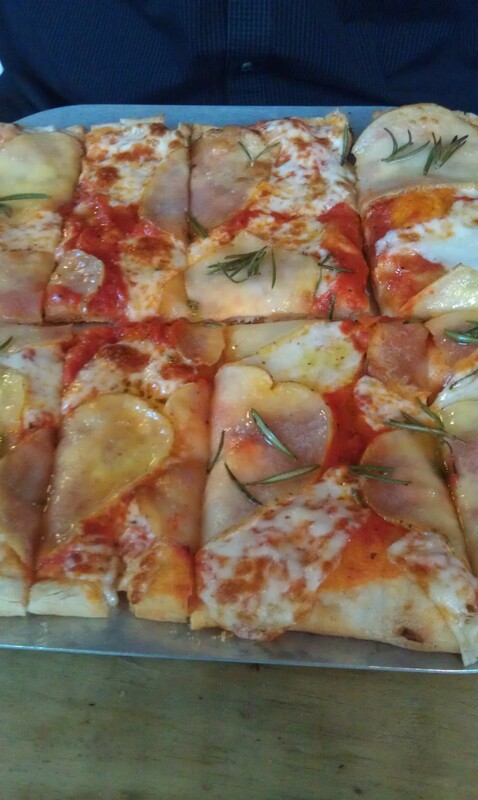 In fact, Campo de Fiori leavens their dough for 24 hours–a long time for pizza dough. Very interesting, so we tried it. The food was delicious; sadly, I can’t say the service was nearly as good as the food. Campo de Fiori prides itself on being a pizzeria and an Osteria Romana, which, according to their website, has something do with Roman hospitality. They serve pizza, salads and various pasta dishes, and have a nice wine list (though the wines we ordered were not available that night). 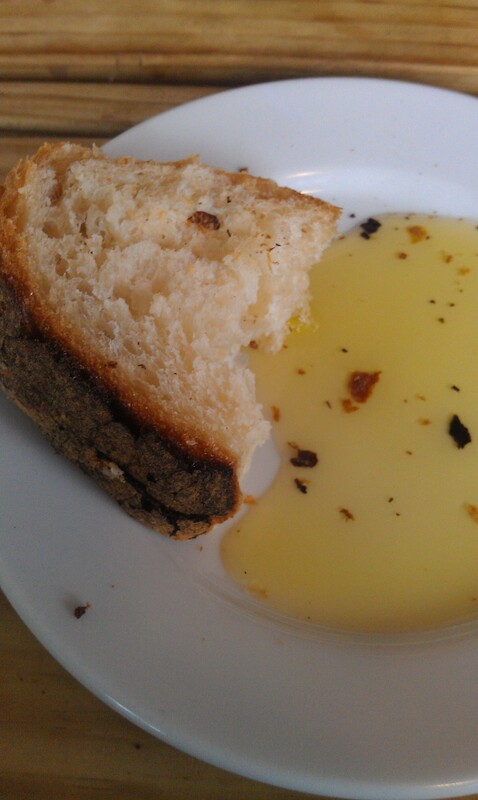 I should begin by discussing my “thing” about Italian restaurants: I seldom go to them. Why? I am Italian-American, after all. Shouldn’t I like Italian food? Oh, I do, believe me. I make it all the time. That’s precisely why I don’t like going to Italian restaurants. My thinking is that if I can make it at home, it’s probably not worth trying out. Now, I’m no chef, but I am a pretty good cook, so if I can cook it up, it’s probably at least as good as what some restaurant is going to serve. That may sound conceited. It’s just honest! Once we ordered our food, a server brought us a little bag filled with bread. Now, this was no ordinary bread. It was at once chewy and crisp–exactly the way bread should be. You can see it in the above photo (click to view full size). Don’t drool too much all over your keyboard. 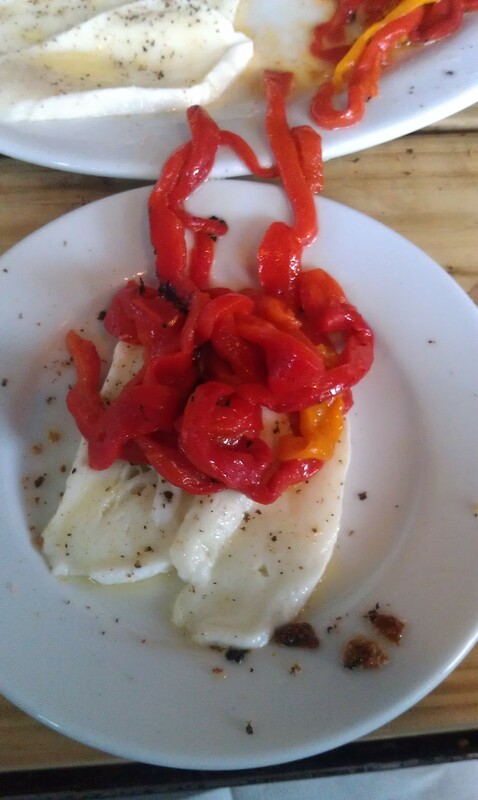 We opted for the roasted peppers with mozzarella di bufala for an appetizer. They way they plated it was interesting–the roasted peppers must have been put into a dish and then flipped onto the plate, with the thinly sliced mozzarella di bufala splaying out around the peppers. What I liked best about this dish was that the roasted peppers were hot. Most of the time, for an appetizer, roasted peppers will be served cold or at room temperature. I liked that they tasted like they were just out of the oven. And the mozzarella was perfect. Highly recommend this dish. For our entrees, my dining partner ordered the Contadina pizza, which was served with very thinly sliced potatoes atop mozzarella and San Marzano tomatoes, while I ordered the Rigatoni Carbonara. I tried my dining partner’s pizza and the crust was truly spectacular. Like the bread, it was chewy and crisp at the same time. My dining partner said he would have liked for the potatoes to be a bit thicker, but he was overall satisfied with the pizza. 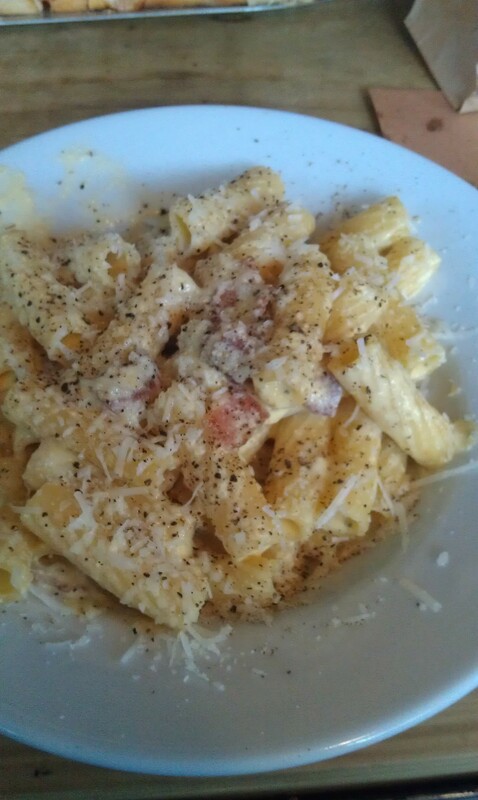 My Rigatoni Carbonara was pretty good, but not fantastic. The pasta was cooked perfectly al dente, which was nice and a surprise. Many times when you go to Italian restaurants, they actually don’t cook the pasta al dente–either too hard or too soft. This was just right. Carbonara involves bacon (or pancetta), egg yolks and cream. Instead of going with the pancetta, it seemed like they used regular bacon, which is worth noting since it was slightly fatty. The sauce itself was pretty good–not entirely flavorful, but not bland either–and shredded parmesan cheese was amply spread across the top of my dish. One thing that I didn’t find awesome about the pasta was that they used way too much black pepper on top. The pepper overrode the flavor of the Carbonara sauce. After we finished our food, we must have waited 30 minutes for someone to finally take our plates away from us. When we arrived at the restaurant, it was nearly empty, but, over the course of about an hour, the place started to fill up. I guess they were too busy tending to other tables, but why does that make our plates less important to pick up? Finally, someone came over to our table and asked if we wanted dessert (yes, cannolis, which were fine but not made with the typical cannoli cream found in most cannolis). Then, our waiter mistakenly brought our check over (he clearly hadn’t communicated with the man who took our dessert order), and then we waited 10 more minutes until our cannolis were brought to us. Take the R to Union Street and walk a few blocks.